NOTE: I choose to use the word ‘token’ or ‘wampum’ when I write about the usuryfree community currency movement because governments all over the world assume that they have control over forms of money that refer to themselves as ‘currency’ – which is defined: ‘Money in an form when in actual use as a medium of exchange, especially circulating paper money.' In this article I will use the term ‘usuryfree time token’ to refer to the proposed time trading unit. A small Greek Town (Volos) Develops a Bartering System Without using the Euro: http://www.youtube.com/watch?v=9y9R0v96K48 and the BBC reports it as a ‘good news’ item. Likewise RT also reports: http://www.youtube.com/watch?v=-dIEqFOG-wE the story as a ‘good news’ item. After having been in Cebu City, Philippines for two weeks, I have witnessed extreme poverty and abundant wealth. And in the middle, I have had the opportunity to meet many young entrepreneurs from foreign countries who have settled here in recent years to launch successful online businesses. The foreign owners of these online businesses with whom I have had interactions, display a high degree of integrity and they offer not only fair monthly wages, but also excellent working conditions to their Filipino employees. I hereby encourage these young, successful entrepreneurs to become familiar with the usuryfree time token movement with the intention of considering possible ways that they could co-sponsor the launch of a usuryfree time token here in one of the barangays in Cebu City. The young, enthusiastic and highly skilled Filipinos that are being employed by these innovative entrepreneurs who have moved here from other countries are either still enrolled in schools, or they are interns or recent graduates from local schools. They are very appreciative to be able to help their families by bringing home a pay regular pay cheque. I have had conversations with these young Filipinos – some who are fortunate enough to work in air-conditioned offices and others who have to endure the summer heat while working. When I bring up the topic of economics, and ask them why in 1961, two Filipino Pesos were equivalent in value to one Dollar (American Funds) while in 2012 approximately 45 Filipino Pesos are equivalent to one Dollar (American Funds) – they commonly respond with a statement that it is because the banking power of the western world has caused the devaluation of the Filipino Peso. There now are options: (a) to continue to be pillaged by the international financiers by resigning to the status quo and engaging in commerce by relying solely on Filipino Pesos – which by definition are another usury-based currency just like the Canadian dollar or the American dollar or the British Pound etc. or (b) in the alternative to take action to by implement local barter/trading systems that will permit participants to negotiate trades with a usuryfree time token in combination with Filipino Pesos. These usuryfree time tokens are becoming popular because they give value based on the honesty and integrity of the local traders. Additionally, the value of these usuryfree time tokens is backed up by the local productivity of prosumers – people who produce and consume. A functional, usuryfree time token system helps local consumers swap products and services to meet their individual, family and small business needs. 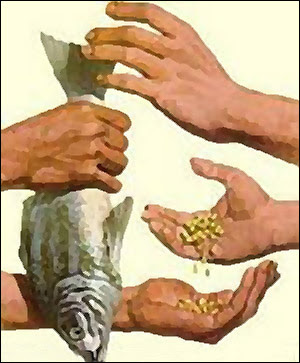 A key point to understand is that the creation and growth of a flourishing barter system is the starting point to re-build a truly sustainable economy, that will restore honourable principles of local co-operation and commence the shift to permit barangays to eventually decentralize from the global banking cartel that has a usury grip on the entire Filipino economy – where there is abundant evidence of poverty, scarcity and lack. The Filipino economy is struggling in a manner similar to all of the other, conventional economies all around the world that are paying usury on debt to the global banking cartel. Research indicates that It is common for these local traders to use a combination of federal dollars in combination with any usuryfree time token as these barter/trading networks go through the birthing process. For example, a product that retails for 100 Filipino Pesos may have a wholesale cost of 60 or 70 Filipino Pesos. Therefore, since the retailer may have to pay the wholesaler in Filipino Pesos, s/he would probably negotiate the trade and accept 80% in Filipino Pesos and 20% in the local, usuryfree time token. By trading within this ratio, the retailer will be able to cover any costs of doing business with the amount of Filipino Pesos earned. Readers may ask: Why would any local entrepreneur choose to participate and accept a usuryfree time token as partial payment for any negotiated trade? The answer becomes obvious when a little knowledge is gained about the power and potential of any trading token when the element of interest or usury is removed from the function of money. Since the re-birth of bartering and trading with these usuryfree community tokens in the early 1980’s – with the launch of the first usuryfree software referred to as the LETS (Local Employment Trading System) software, those who are participating are learning how to use the usuryfree time tokens to acquire some of the basic needs for daily living and/or business expenses and whatever usury-based, debt money they are able to save, they are encouraged to use it to pay off any outstanding loans or mortgages, as it is the interest or usury portion of debt that is the killer machine that keeps debtors financially enslaved to debtors for generation after generation. After witnessing the technological skills and savvy of the young Filipinos and likewise, the honesty and integrity of the young, foreign entrepreneurs who have established small to medium-sized businesses here in Cebu City, I am convinced that what the Greeks can do, the Filipinos can do. Back in 2004, The Family Life Foundation – a duly registered charitable organization in Canada, came forth to offer financial aid to help launch Tamworth Hours Project in an economically depressed area of rural, eastern Ontario. Though, the Tamworth Hours Project has since been temporarily shelved, many lessons were learned that can now be shared with others who are ready and willing to launch a usuryfree time token in their respective local communities. The Family Life Foundation has a mandate to support the launch and development of the usuryfree community currency movement - and hopefully, they would be willing to support such a project here in the Philippines. I challenge any barangay in the Cebu City or elsewhere in the Philippines to assemble the brightest, youthful minds to research and develop a bartering system that will permit local consumers to negotiate trades using a usuryfree time token in combination with the usury-based, debt currency commonly referred to as the Filipino Peso. I daresay, that the local and internet media will report such an initiative as a ‘good news’ item also. This website has compiled list of usuryfree time currencies that were operating earlier in this 21st Century: There are more usuryfree time currencies being launched now all over the world. Readers are invited to do a search of ‘usuryfree time currency’ and you’ll learn lots that you didn’t know you didn’t know! As you learn how simple it is to launch a usuryfree time token, you, with the co-operation of others in your local network can take a leadership role and birth a usuryfree time currency in your local community. NOTE: To examine samples of other usuryfree community tokens click here. This is a very interesting and encouraging article-offer of Mr. Tom Kennedy to the Filipino people. We must be thankful and grateful to Mr. Kennedy. Filipino citizens can start up as a pilot project and initiative. I am convinced but I need fellow Filipinos's participation. This is not just one person's task. The time is ripe to introduce local, usury-free time currency to Filipino people while we still hope for general monetary reform. This can practically help poverty reduction in the countryside, in the villages and provinces. If we can try this scheme, I think there would be no more brain-drain or diaspora in the country. It can also foster sharing and cooperation. Local Currency Groups in Canada are a source of inspiration and uplifting to start something as alternative solutions for sustainable survival for the Filipinos. I wrote an article below, 7 years ago, and a portion of my manuscript- The Savage Cruelty of Debt. I will review this matter thoroughly further. Despite of the fact that Philippines is belong to third world or to fourth world nations, there is already undeniable plenty of human commodities, products and resources for human life survival either produced locally or imported but prohibited to be consumed, some or many are decaying, expired or destroyed, because of the chronic shortage of money as necessary to obtain them. This results to a disastrous paradox that people experience and witness the most debilitating, torturing, brutalizing and back-breaking and nerve-wracking loads of poverty, widespread hunger, debts and chaos and hundreds of thousands of children in our province and millions in the countryside are suffering actual hunger, malnutrition, diseases, starvation, deprivation, abuses and savage cruelty of death because of the lack and absence of money, purchasing power or financial credit. I urgently propose local currency or community currency circulating notes for the local economy as the best economic alternative in order to save groaning poor Filipinos in the province and in all Philippine provinces, and strengthen all provinces for stable local economy. One of these is to set up a Provincial Monetary Currency Committee to be headed by the Honorable Governor and the Provincial Board Members to create and print the Philippine Peso money necessary to meet the needs. With the approval of the President, with the stamps of the Department of Finance and its Bureau of Treasury, the Provincial Government can create and print the EMERGENCY CIRCULATING LOCAL CURRENCY NOTE IN PHILIPPINE PESO for 2012-2015 only exchangeable within the province for trading purposes. With the political and economic will for local stability and survival of the inhabitants while major national monetary reform is being pursued for possible legislation and implementation, and with the authority of the local government officials, and the needed requirements, there will be a necessary increase of money supply circulation in the province I the form of newly-created debt-free money as emergency local circulating note to help save the groaning poor inhabitants poorly financed Provincial Government. This proposal is very possible as it is successful in the Island of Guernsey, UK (Visit: www.visitguernsey.com). With alternative/local or community currency circulating in the province or to any Philippine provinces, it will help to stimulate good flow of production and in harmony to consumption with less and less misery. There will be improvement of the purchasing power in front of the cash prices of basic essentials, and will progressively provide financial-economic security to every citizen in the province. We will be less dependent on foreign loans, aid and will consequently lessen graft and corruptions. 1. to improve and modernize the province. 2. to help, save and enrich the poor inhabitants through the form of supplementary basic income or dividend. There are so many poor whose lives have been ruined by unemployment, lack or absence of opportunities, poverty, debts, diseases, hunger, injustice, violence, political chaos and parties, insurgency, debacle of natural and man-made calamities and difficult struggles for survival. 3. to build homes for the homeless families and beggars. 4. to build and re-build more schools and alternative study buildings for the unschooled and uneducated inhabitants. 5. to build or re-build really concrete roads from the villages and mountains to towns and cities or from villages to markets, schools and churches. 6. to totally prevent poverty and prevent poverty traps in the future. Many communities and provinces in the Philippines suffer from the lack of a sufficient supply of means of exchange, i.e. money. This is presently causing a decline in a sense of community, in the relations of socio-economic solidarity among the community members or provincial citizens as they compete for SCARCE MONEY, with the rampant results of increasing crimes, violence and community degradation. The solution proposes here is to facilitate local currency scheme or three-way barter in the marketplace by issuing a MARKETPLACE CURRENCY. Everyone has something they can do for others, and something that they need from others. This can be used in a marketplace in which goods are traded, and socio-economic solidarity is developed. In this age of plenty, automation and computerization, money could be the easiest thing to create and print. There is no shortage of paper, ink and machine to do so. What is primordial is the need of “economic will” for sustainable local economy. With enough money supply in circulation, the provincial or local government(s) will be able to creatively respond to build up environmentally friendly sustainable livelihood projects for the long-term for the benefit of the present and generations yet unborn. The province (and all Philippine provinces applying the same schemes and alternative proposals) will incur no additional debts to the private/commercial/international banking institutions of monopoly of mafia men and will no longer depend on foreign aid that oftentimes with strings attached and conditions. There will be no so much provincial and national fiscal crisis but development and prosperity for all Filipinos. As a Filipino Monetary Social Crediter and a Reformer, this has been my initial proposal for our local circumstances to help and save the inhabitants in the most degrading poverty and financial hemorrhage. Certainly, we need more consultations and studies for the effective implementation of the schemes. This is a radical initiative for economic alternatives and monetary reform towards sustainable living. This can give us a guaranteed freedom from the enslavement of debt finance and debt-related poverty in the Philippines. Hello, I have read again the posted article to Mr. Tom Kennedy and I also likewise invite everyone and if possible thousands of fellow Filipinos who have almost on the same difficulties and adversity for decades, if not millions across the country, and also invite those Filipinos in diaspora communities overseas to read and study the UsuryFree Time Currency and let us help each other to try and experiment the proposal. I am not saying that the proposal is a panacea or a cure-for-all Filipino people but that scheme could help lighten our burden for survival. I think the challenge being posed by Mr. Kennedy is timely positive worthy of everyone's brain-storming for alternatives for our survival. His encouragement to try this one is worth doing. We're facing rough and threatening times for our very survival and we need sane alternatives. Mr. Kennedy's admonishment to try this scheme is correct. In his 2 weeks stay in the Philippines, he is able to also diagnose the problems in the Philippines. I am asking fellow Filipinos to have a panoramic view of the problems with open mindedness and reform-based creativeness. Under the present debt finance disaster capitalism and compounded usury, in the periods of economic trauma in the Philippines, we are paying the terrible price of dreadful poverty, malnutrition of children and adults alike, illnesses, homelessness with daily instances of demolition particularly in the slum areas in the countryside. The devaluation of our Philippine peso is criminal and very serious in front of the rising prices of basic needs and services. Millions of Filipinos are constantly struggling daily to make their daily survival possible and make order out of economic chaos. The best method of the economy of reconstruction and resuscitation is via debt-free and usury free economy. We need relief after economic tragedies of debt. We have to try this one and see the results and replicate all over. If you learn something from this video clip please share the link. And thanks to Frankie Gotz for uploading this video clip. JOIN Frankie's channel at YouTube and do a search for Frankie Gotz n at Facebook and thank him when you request to be a "friend." |We must support and help each other to make this information go viral NOW! Usury free currency WILL save the world one county at a time.